of other teams joining but details are yet to be finalised. should contact me on the phone number above. In a very tense final last years runner up Keith Parkinson from Newstead "A"
beat Steve Hall and Mark McEvoy from the Claremont. In the final Steve Geddes from Peg Legs beat Mark Brooks from Gateway. PRESIDENTS CUP WINNERS - CLAREMONT "A"
FIVE-A-SIDE WINNERS - CLAREMONT "A"
Queen of Martyrs in the final of the Secretaries competition. their last game of the season. Commiserations to Claremont and Newstead "A"
who finished joint second just two points behind the champions. night. Newstead "A" and Claremont both won to remain tied in second place. There were wins for Peg Legs, Ship & Mitre "B", Queen of Martyrs and Arkles. Registration forms for next season were given out at last weeks league meeting. and the player registration form need to be returned at the July meeting. New teams are welcome to sign up for next year. Please contact me for details. at the league meeting in May, this includes the final monthly subs for June. beat Ship & Mitre "B" and are now joint second with Newstead "A". Elsewhere there were wins for Masons, Queen of Martyrs, Ship & Mitre "A"
go level on points with Gateway with only three games left to play. bottom club Newstead "B" suffered another defeat to Arkles. Newstead "A" "B" v Peg Legs "B"
Wellington "B"   v Claremont "A"
Gateway "A"      v Wellington "A"
Matches to be played Monday 4th April. Legs, Village, Liver Vaults and Ship & Mitre "B". three all won and there's still only two points separating them. Queen of Martyrs v Ship & Mitre "B"
Peg Legs        v Newstead "A"
your oche skills against them in a fun competition compered by star referee Russ Bray. part in a poker tournament after the darts. Competition entry(teams of four required). Meet and greet with Eric,Keith and Russ. There was only one game this week with Peg Legs beating Liver Vaults in a re-arranged game. their two point lead over Claremont and Newstead "A". In the Presidents Cup Semi Finals Claremont beat Gateway and Newstead "A" beat Masons. in the final after Arkles beat Ship and Mitre "A". 14th March with one winner per block to go through to the finals. Vaults playing a re-arranged game from earlier in the season. 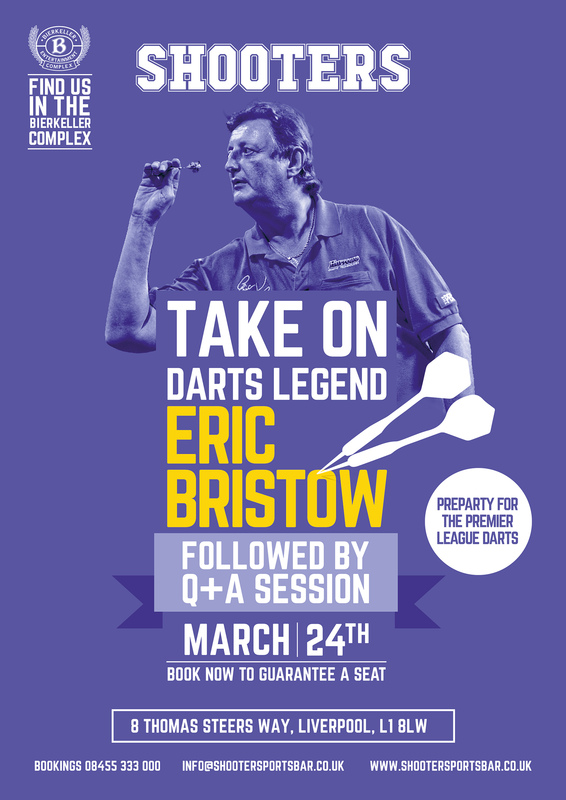 Eric Bristow MBE will be taking on all comers at Bierkeller Complex between 1PM & 5PM. Entry is completely free to everyone & we'd like to invite all darts afficionados. with a six dart game, starting with 146 and finishing with a 155 out shot. both recorded a six dart game and both players on that night were named BROWN. next week where Claremont and Newstead "A" meet in what could be a season defining match. and they will join the secretaries from Glasshouse and Ship & Mitre "B" in the next round. to play in the secretaries competition, no substitutes are allowed. FIRST POINTS FOR NEWSTEAD "B"
Claremont closed the gap on the top two with two wins over Ship & Mitre "A". Peg Legs. Newstead "A" scraped home 5-4 against bottom team and neighbours Newstead "B". of the league and their families all the best for the festive period. place in fourth position and move two points closer to the top three. Queen of Martyrs and Ship & Mitre "B". In last weeks Presidents Cup the top three all went through together with Masons. The good scores from the last three weeks have now been added to the website. All last weeks "good scores" will be put on the site after tonights matches. four to be played on 22nd February. bottom Newstead "B" have another 13 games to try and achieve that elusive win. week so there's no change at the top or bottom of the league. Queen of Martyrs v Newstead "B"
Arkles           v Ship & Mitre "B"
and matches are to be played on monday 23rd November. missing results can you let me know. the bottom after their latest defeat by Arkles. Peg Legs, Liver Vaults and Ship "B"
round games have been played. If there are any changes to be made please let me know. the early part of the week. Anyway results have now been entered and tables updated. I've held over the Good Scores from this week and will post them next week. for Arkles, Liver Vaults, Peg Legs and Masons. secretary can send me a round up of results for their team. Claremont and Queen of Martyrs. today so if you printed a version off before then you will need to re-print. Wellington, Newstead "A" and Village Inn. They join Gateway and Glasshouse in the next round. The losers from last nights matches will be entered into the Tony Donaghue Memorial Cup. number generator off the internet. results can you let me know please. three games to win 6-3.
picked up their first points of the season with a win over Newstead "B". Last nights results have been posted on the website. The top three remain unbeatean. to fulfill a fixture and Arkles penalised by one point for rearranging a fixture. (13) Wellington        v ( 7) Newstead "B"
(12) Village Inn       v (11) Ship & Mitre "A"
Matches to be played on Monday September 7th. have TWO points deducted. The change to apply to the current season. Wins for Newstead "A" and Gateway over Wellington and Arkles as both remain unbeaten. teams, Newstead "B" and Glasshouse, have yet to register any points. passed out at the league meeting. The new secretary is Gareth Thompson on 07879-884-974. The "Venues" tab has been updated accordingly. Mitre "A", Claremont and newcomers Gateway though the latter two have only played one game. scores or finishes that haven't been posted then text me the details. and last seasons champions Claremont was postponed and will be played at a later date. for last nights losers to get back on track. Good scores from last night have been posted on the website. passed out at the league meeting. The new secretary is Peter Mylchreest on 07850-333-440.
sheets. Can all secretaries check that the all their players are on the list. for the first time. All fixtures etc have been updated. or first round of the President's Cup.